8th Annual Jerry Day ATL 8/2! 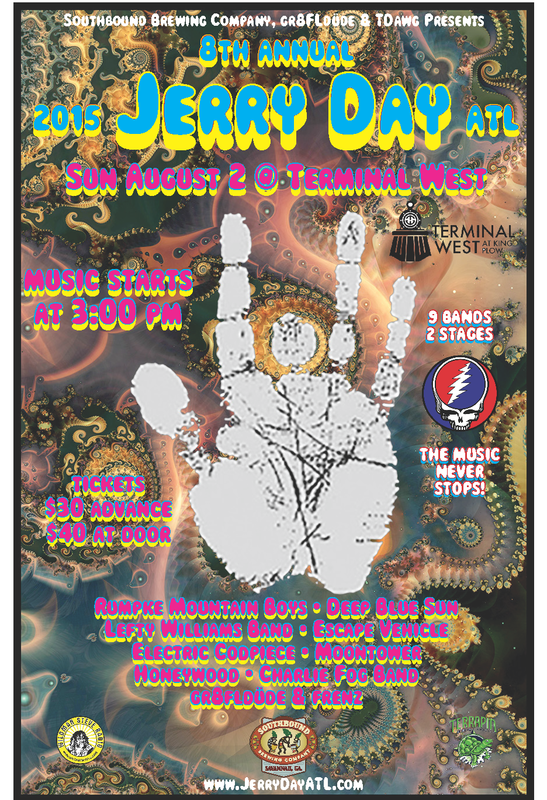 We’re only FOUR DAYS out from what promises to be quite an enjoyable journey through some of your favorite Grateful Dead songs as well as some rarely heard gems! Remember that no song is repeated, so come early and enjoy the air conditioned environment for the music and dining at Stationside Restaurant! Click Here for Advance Tix! Advance tickets are $30, door price is $40. Save yourself a few bucks and get your tickets NOW, as we anticipate a strong turnout! Below is the schedule of bands. Please note as always schedule is subject to change. Tags: americana, atlanta bluegrass, Atlanta Live Music, Atlanta Live Music Calendar, Atlanta Music Scene, Bill Kreutzman, bluegrass, bluegrass music, blues music, bob weir, David Gans, Deep Blue Sun, Grateful Dead, jerry garcia, Lefty Williams Band, Mickey Hart, Moontower, Phil Lesh, southbound brewing, TDawg Presents, Terminal West, Terrapin Beer Co.
← 8th Annual Jerry Day ATL 8/2!